Annie really wants to learn how to knit. But when her mommy teaches her the stitches, she feels frustrated that her knitting looks more like swiss cheese than a real scarf. Will she slow down, be patient, and keep trying? 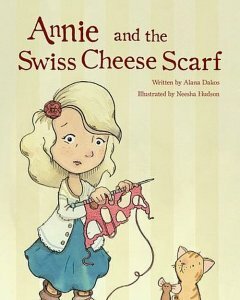 Annie and the Swiss Cheese Scarf is a story about overcoming hurdles to learn something new, even when it's challenging. In addition to the story, Annie and the Swiss Cheese Scarf also contains special features. Find the Cat and Mouse: Annie's cat and mouse friends are hiding on every page. Can you spot them? Learn to Knit: A knitting instruction section in the back of the book will assist your child in learning the basics. You can also view all Annie and the Swiss Cheese Scarf.